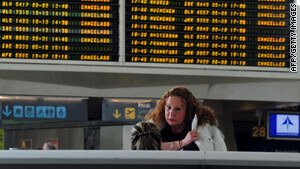 A passenger stands in front of a board showing canceled flights Saturday in Bilbao, Spain. (CNN) -- Ash spewing from an Icelandic volcano prompted flight cancellations in parts of Europe again on Sunday. Eurocontrol, the agency that manages European air travel, expects 24,500 flights on Sunday -- about 500 below average for a Sunday at this time of year. The agency said that ash eruptions were affecting air space, particularly between the ground and 20,000 feet. Officials in Italy closed airports in Milan, Pisa and Florence at least until afternoon. In Spain, the Santiago de Compostela, Vigo and La Coruna airports were also expected to remain closed until Sunday morning. Six Scottish airports have also been closed. The ash cloud also disrupted flights to and from Switzerland, southern and central France, and northern Portugal, authorities said. Authorities hope that the area affected by the ash cloud will shrink during the day and the closed airports will reopen. While the ash has also affected trans-Atlantic flights, most airlines are rerouting to avoid the area. This is leading to some delays, but significant cancellations have not occurred, Eurocontrol said. On Saturday, there were 22,424 flights -- about 200 below normal traffic levels. The problems began in mid-April, when the volcano beneath the Eyjafjallajokull glacier in southern Iceland erupted and sent a cloud of ash into the atmosphere, closing most of Europe's airspace for six days. The shutdown snarled global air travel and stranded tens of thousands of passengers around the world.